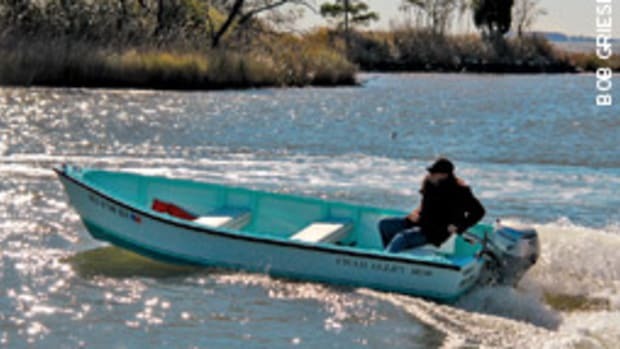 Richard Griffiths, profiled in the March 2009 issue of Soundings, is a feature at Oxford Boatyard in Oxford, Md. The English-born 70-year-old has lived a cruiser’s life of adventure, most often aboard his converted 1903 lugger Rosalind, and here shares one of his close calls. 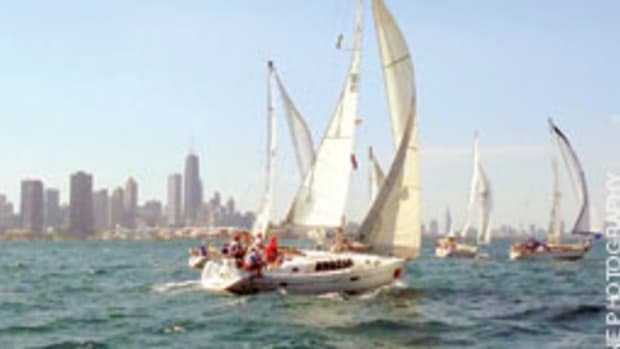 Most of the misadventures that befall novice sailors probably occur in the first two or three years when they are attempting to get their boat from one harbor to another. 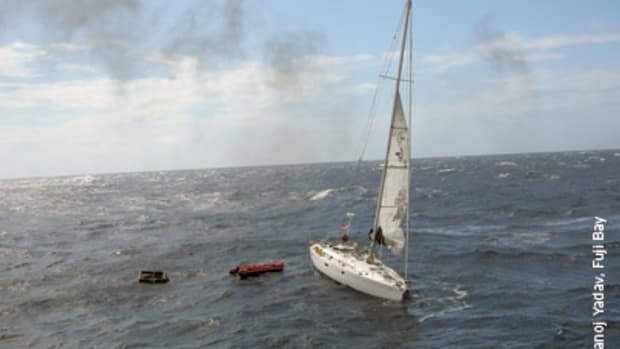 And if one is lucky enough to survive these mishaps, there hopefully comes a time we can genuinely say we have completed a voyage without a dangerous incident. 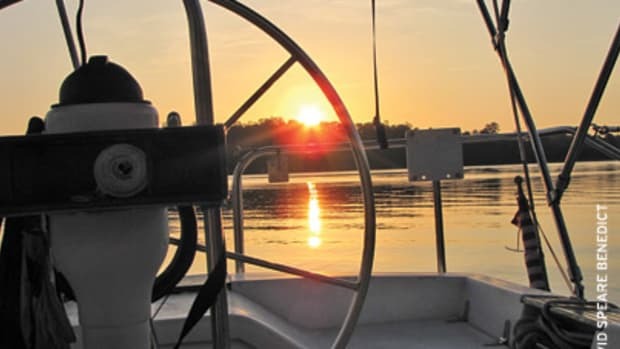 Nowadays, unfortunate accidents in our sailor’s apprenticeship are often avoided not so much by skill, but because the boat is equipped with a powerful modern diesel engine and 21st-century navigational electronics. If those should fail, the ubiquitous VHF radio is also on hand to call the Coast Guard or Sea Tow and, of course, the equally ubiquitous cell phone. We had none of these in this Year of Grace, 1963. It was three years since my first crewing and near-death experience on the ill-fated Nomad off the coast of France. And now, after a long and arduous conversion of Rosalind from derelict fishing boat to primitive yacht, I was finally in command of my own small 22-ton ship. I and a small group of assorted idiots had the misguided assumption that we were veteran wanderers of the deep. We had the imbecilic plan to take the boat from Shoreham-by-Sea on the south coast of England, where she had been abandoned in the mud for more than 20 years back to her birthplace, the Port of St. Ives. Dangerously naive and stupid, coupled with the invincibility of youth, we could have taken first prize for Ocean Going Lunacy with a couple medals thrown in to boot. Though Rosalind’s hull was still strong for her 60 years, her rig — comprising cheap, natural cordage — was highly questionable. Indeed her entire rigging consisted of cast-off spars, and stretched and worn-out cotton sails that tended to blow out on you. Even more dubious was her mainmast, which had started life many years before as a utility pole and had never been required to perform in its new capacity as a yacht mast. I was the most experienced person on the boat, and only a dangerously new captain would have planned such an ambitious trip. I had inadvertently set us up for near certain death. As I look back on it now, the entire house of cards was poised to come crashing to the deck under adverse conditions. For those of you who are hazy about the geography of England, in the extreme southwest peninsula of Cornwall there is an iron-bound coast. The towering cliffs rise almost vertically from the restless ocean and are exposed to the full force of the west winds that blow 3,000 miles across the Atlantic. It has the ominous name of Land’s End and is the closest headland in England to the Americas. The harbor of St. Ives lies around this promontory on its northern side. To make the rounding of Land’s End even more hazardous, a small scattering of rock- and reef-infested islands lie a little more than 20 miles westward. Called the Scilly Isles, they can probably lay claim to the highest number of shipwrecks in the world. The forecast was for southeasterly winds, unusual for those waters but helpful to blow us westward ho. We sailed at dawn. Clearing the harbor in the early morning sun, it did cross my mind that there were no fishermen at sea. I should have known. No fishermen equals bad weather … but you can’t pay attention to something if you don’t know what you should be paying attention to. When we were less than two miles from the Falmouth harbor bell buoy, what should have concerned me but didn’t was the steadily deteriorating visibility — not by rain or fog, but by a strange haze. Less than a mile away, the emerald-green fields capping the summits turned to gray, then to shadow and then were gone. With the optimism of youth, I hoped and assumed that the haze would burn off and we would see again the high cliffs before our turn to the northeast off Land’s End. 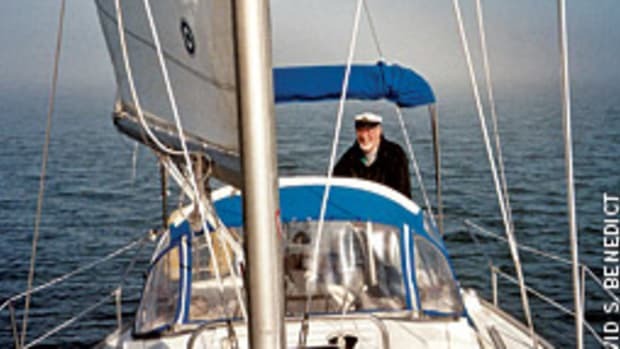 With the wind almost dead aft and the sea reasonably smooth, we were making Rosalind’s maximum speed of 7 knots, and it was probably the first time I reveled to feel Rosalind at home in her element, enjoying the sea she had once fished as a young girl. These seas were, to be sure, increasing in height with curling crests, which Rosalind’s stern rose to beautifully in the rising wind. It was at this point that the first premonitions of possible disaster may have stirred in my gut, telling me things were not as they should be. I was starting to pay attention. I consulted the log that we were trailing behind us. It registered that we had traveled the 40 miles we needed to theoretically pass the southwest tip of Land’s End safely. The time had come to change our course dramatically, 90 degrees to the northeast. As we hauled in the sheets, the cresting waves that had seemed so benign when the vessel was running before them abruptly altered their character. We trimmed the sails for the new course and the boat heeled alarmingly, with the rail nearly in the water and with heavy bursts of spray blowing across her deck. The bowsprit lifted only to crash down into the waves, sending pounding shudders through the boat and us. This new course was untenable. We were going to bust something. With the main down, Rosalind was no longer overpowered. But with only a headsail left, she was quite unable to hold the desired course for St. Ives. And, for the safety of the vessel, we had her bore away downwind to her previous course, westward in the wake of the long-ago-launched Mayflower, on a course to the New World. It was here, off Land’s End on that day long ago, where I first formulated what I call the two F Factors at Sea: Fear and Fun. The Fun was over. Fear had begun. I knew vaguely how to heave to, at least on paper. But the farther we would have gone off the land, the steeper the seas would have become. What appalled me also was the violent and gyrating motion of 22 tons of wood. We could hear the occasional disconcerting crash of objects below decks. I was handling the boat ineptly and risked blowing out the sails. The crew continued to hang on for grim death and gave me concerned and expectant looks as if there were some way I could control the boat. The loneliness of command was new to me. I was confronted with the first critical decision I had to make as a new captain at sea. I understood charts and knew how to steer a compass course. Frightened and perplexed, I went below to study the chart. With no engine or radio, I concluded that the situation had become grave. 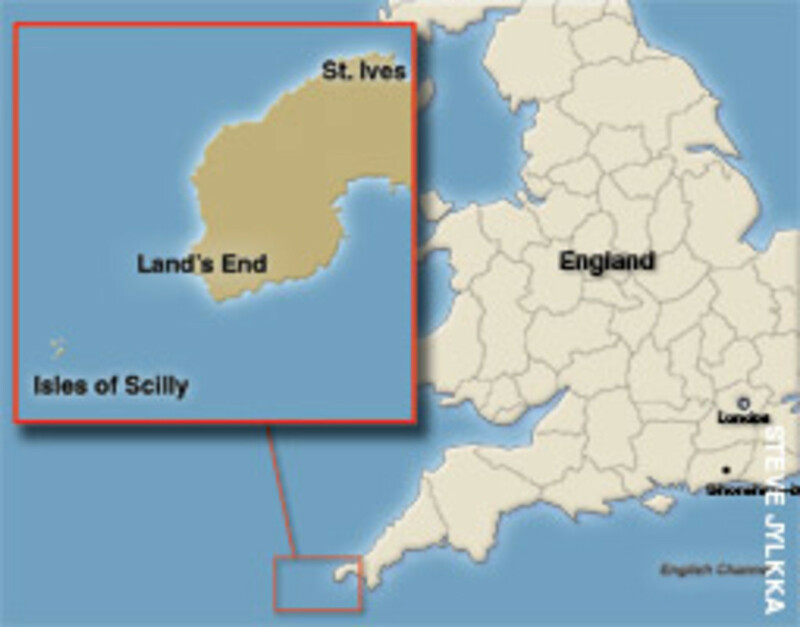 The only possible alternative ahead was the notoriously lethal Scilly Isles. It was in similar thick, hazy weather that Admiral Sir Cloudsley Shovel lost his entire fleet when returning from the West Indies station in the 18th century. And the only American seven-masted schooner ever built, the Thomas Lawson, also met her watery end in these same islands. I decided a quick death was better than a long, drawn-out one. So, for better or worse, we adjusted to a hopefully correct course for the tiny opening between the rocks of the Scillys. 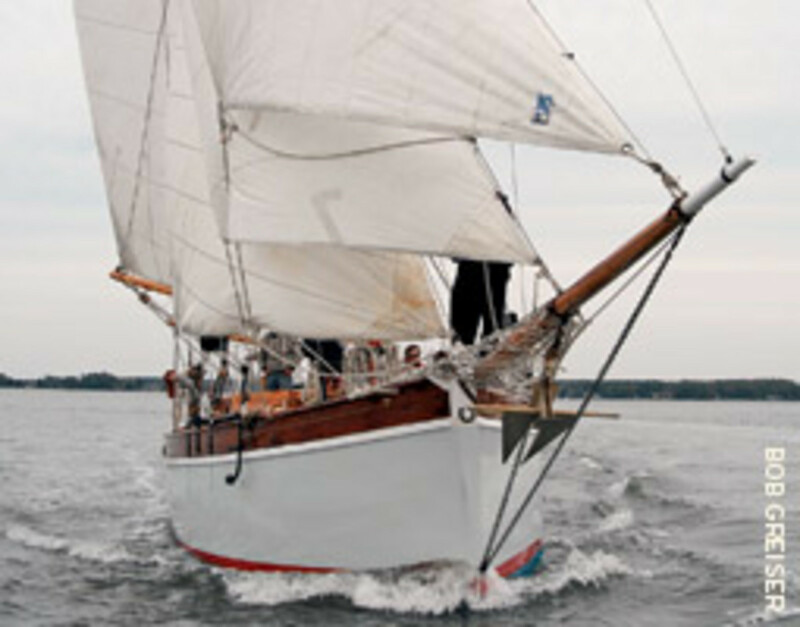 I was dead reckoning from a fairly weak position, because we hadn’t seen any land since leaving Falmouth 50 miles back. 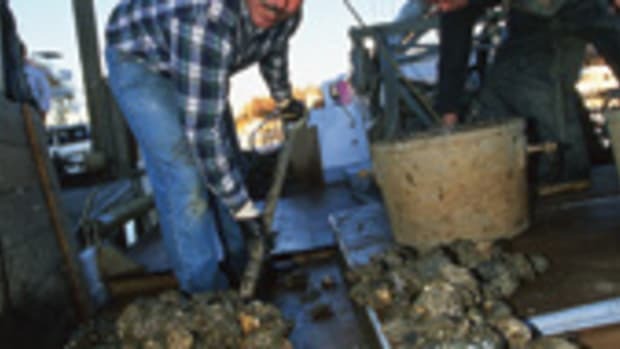 A mistake would lead to a watery grave. Success would reward us with warm beer in an island pub. It makes me frightened to think back on it now, and I’m relieved I don’t have to make that decision today. 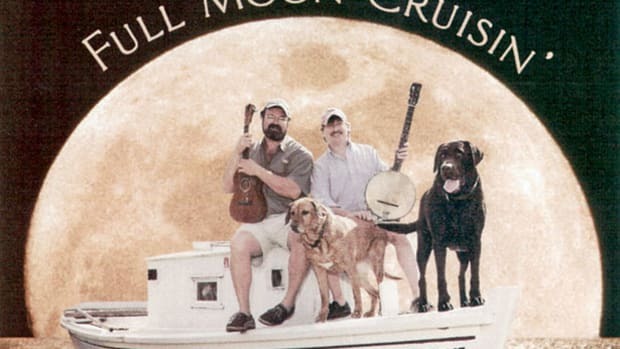 I assigned the wheel to Bob Riddle, our best helmsman, who could clearly see the compass with his bottle-bottom eyeglasses but was basically blind as a lookout. The rest of the crew crawled forward. With one white-knuckled hand clinging to the rigging and the other hand cupped to the ear, we strained to hear the moan of the powerful foghorn on the lighthouse marking the opening between the rocks. The steady walls of water behind us were fully cresting into ever-steeper rollers. In the occasional fearful glance back over my shoulder at our boiling wake, I decided I didn’t want to see what I was seeing. For the next two hours I secretly experienced maximum levels of fear fueled by adrenaline. Things can change at sea in a flash, and there was a shift from panic over probable death crawling around in one’s mind to joy and relief when the starboard watch forward shouted back that he was positive, without doubt, that he could hear the hoped-for moan of the great horn on the lighthouse. Only a small course change was required, and suddenly and eerily the lighthouse appeared out of the dense haze, guiding our surfing boat with her scrap of sail into the narrow channel and the safety of the inner harbor. This inner harbor is perhaps one to two miles across, and at its head lies the small capital called Hugh Town on St. Mary’s Island. In the calmer water, we once again made sail and endeavored to work the boat to windward. Alas, our seamanship was not developed enough to work the engineless Rosalind to the anchorage close to the small town with its cozy pubs and needed food. The hardy island fishermen, observing our predicament through the window of a waterfront pub, left their pint and pasty and, boarding one of their powerful fishing boats, rapidly approached us to offer a tow to the anchorage close to the town dock and the welcome village pub. We felt 10 feet tall coming in from a dangerous voyage, but inwardly I had concluded that the near-death experience brought me closer to the Safety of Cowardice that keeps all grownup sailors alive. 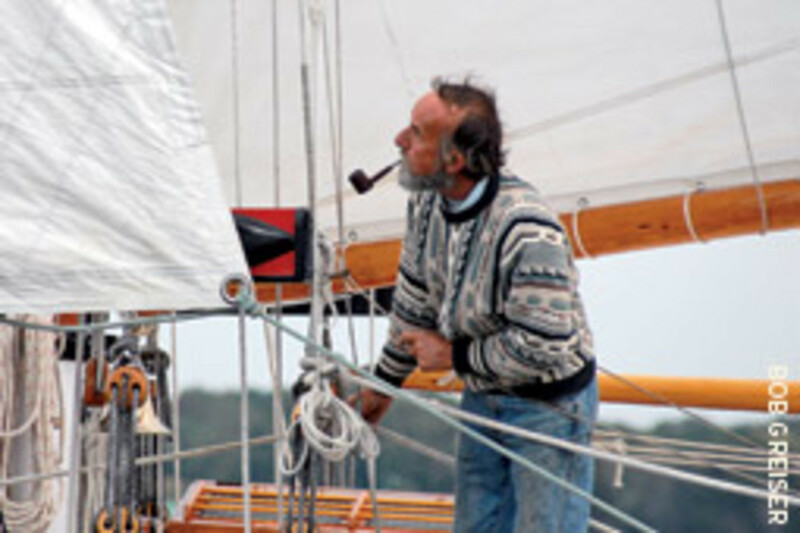 Griffiths wrote about his near-sinking aboard Nomad, a converted 1911 sailing lifeboat, in the March issue. Richard Griffiths, who is scheduling speaking engagements, can be reached at tudruk1951@yahoo.com.